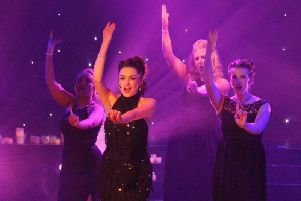 Burnley Light Opera Society triumphed in its performance of Sweet Charity at the Burnley Mechanics last Saturday. As always, the talented cast of actors, singers, dancers and musicians were on par with the professionals. The show follows Charity Hope Valentine - a dancer at the sleazy Fandango Ballroom - on her quest for love. Guileless Charity usually picks the wrong man: the type who thinks nothing of taking her money. But will she finally meet the right man for her? Zoe Tompkins gave a stunning performance as Charity, thanks to fabulous confidence and comedic timing, as well as a powerful set of vocals. Chemistry bubbled on stage with love interests Matthew Dickinson and David Slater as Oscar and Vittorio, both having undeniable charm and star presence. Applause goes to Ann Mason and Sue Avanson, who played Charity’s friends and Fandango girls Nickie and Helene, all vividly bringing huge personalities to life and showcasing lovely vocals. Laura Kay and Laura Blackburn played Ursula and Rosie wonderfully while David Norris blazed on stage with confidence as Fandango club owner Herman. Fierce and feisty support was provided by Fandango girls: Jackie Catlow, Joanne Gill, Lesley Jackson, Catherine Lister, Jennie Miller, Charlotte Norris, Anne Whittaker and Jess Whittaker. Adding elegance to the show were highly skilled dancers Matthew Whalley, Michael Mcginn and Morgan Howard Chambers. Kudos also to a strong company: Danny Morville; Liz Blackburn; Peter Dilworth; Sarah Farragher; Sarah Hayhurst; Jamie-Leigh Hindman; Kayleigh Hindle; Paul Jackson; Debbie Stopforth; Bev Tonge; and Alan Whittaker. Thanks must also go to the talented orchestra and production/backstage team for helping to create such a polished show, as well as director and choreographer Anthony Williams and musical director Steven Mercer for beautifully executing their ambitious vision. It was sad to see a third of the seats in the theatre were empty: it certainly wasn’t a reflection on the cast’s talents. Whether it’s down to the increasing costs of staging a musical, the popularity of at-home cinema platforms like Netflix or audiences having less money for leisure, it would be a real shame to see the curtains close for good on such highly talented Burnley people. Performances continue Tuesday to Saturday at 7-30pm nightly. There will be a Saturday matinee at 2-30pm.